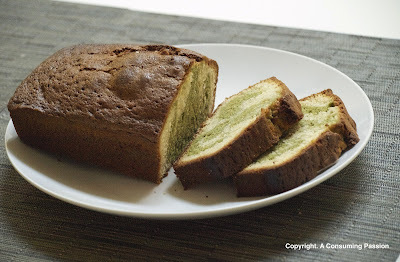 Yesterday, while surfing around food blogs, I came across this post for a White chocolate and Matcha pound cake. Now, white chocolate and matcha is one of my favourite flavour combinations, one that I find works particularly well in this ice cream recipe that previously featured on this blog. After seeing this post then, I just couldn't get this cake out of my mind and absolutely had to make it after coming home from work last night. I was doubly persuaded when I saw the post that originally inspired this cake and another similar post about this cake. While the batter was really easy to make, the problem with pound cakes, and its really not a problem at all if you're patient, is that it takes so long to bake - 50 minutes. Since my cake didn't come out of the oven till about 10 o'clock at night, my conscience wouldn't let me try a slice right away as it was just too close to bed time. The smells, though, were amazing and it took all my willpower to resist cutting a slice then and there. So I dutifully waited till the morning and took my first slice at breakfast. (What makes it ok to eat cake at breakfast but not just before bedtime? Beats me... crazy female logic, I guess.) At first, I didn't find the cake quite so special - likely because I was eating the end slice. You know, it like the end slice of bread that is mostly crust but no crumb. So I took another (!) and this time, I could really taste the white chocolate and green tea flavours coming through. I like! Melt the butter. Place the chocolate in a bowl over a pot of simmering water and let simmer until the chocolate is melted. In the bowl of a stand mixer, place the eggs with the sugar and beat until it is white in color, then remove. Sift the flour with the baking powder and add it to the egg/sugar preparation, mixing manually with a whisk. Then add the salt and butter and mix. Divide the batter in 2/3 and 1/3. Add the melted chocolate to the 2/3 batter and the matcha tea to the 1/3 batter. Preheat your oven at 350 F. Grease a rectangular cake pan and add half of the chocolate batter. Continue with the matcha tea batter and finish with the other half of the chocolate batter. Take a fork and pass it through the different layers of batter. Bake the cake for 50 mins, or until the blade of a knife comes out dry when inserted in the cake. Remove from the oven and let cool for a few minutes before unmolding. I don't know exactly what it is - pound cakes all have the same configuration and then all of a sudden each one is totally unique. This one is really interesting with the green swirls -really like it. 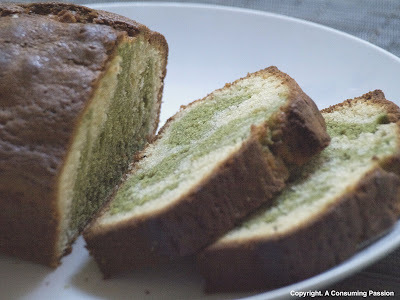 I love the look of this cake...sadly I just can't get into matcha foods. Which is odd because I love green tea. I HAVE to make this! I love matcha!